Photo by Julie Overmyer - Oak Harbor's Clay Schulte carries the ball during Saturday's Division V playoff game against Liberty Center. 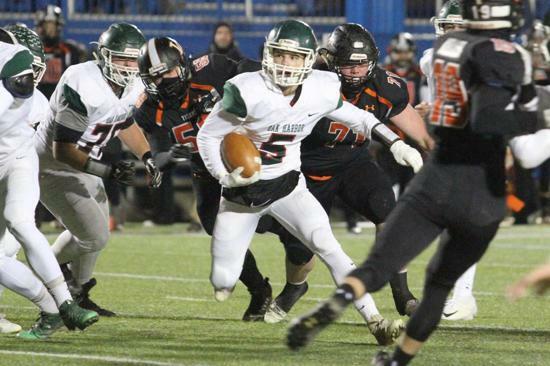 MILLBURY – There was a stretch in the first half that the Oak Harbor defense couldn’t find a way to stop Liberty Center’s Caleb Carpenter. Carpenter punched in two second quarter touchdowns on Saturday to provide the game’s only scoring as the Tigers upended the Rockets 14-0 at Lake High School to capture a regional semi-final victory. The 6’2” 215-pound senior carried the ball 39 times and rushed for 201 yards as Liberty Center improved to 11-1 and advanced to next week’s regional championship game against Genoa. Oak Harbor (10-2 overall) took the opening kick-off and managed to pick up a few early first downs before being forced to punt to the Tigers. Liberty Center quickly established the ground game as Carpenter and Zach Bowers exchanged early rushes. Back-up quarterback Camden Krugh tossed in a few short passes to keep the Rockets’ defense on it’s heals as Krugh completed six of his eight passes in the contest for 45 yards. After a scoreless first quarter Carpenter powered his way in for a three-yard touchdown run with 11:39 left in the half for a 7-0 Liberty Center lead. Carpenter added the Tigers’ second score with 1:26 left on the second quarter clock on a one-yard touchdown run making it 14-0. On the ensuing possession the Rockets got a glimmer of hope when Clay Schulte got loose for a big run setting up the Rockets with a first down in the final moments of the half at the Liberty Center 22-yard line. A series of incomplete passes kept Oak Harbor off the scoreboard as the teams entered intermission. The Rockets stopped Liberty Center on the first possession of the third quarter and looked to be on the move for a second half score, but a turnover proved costly. The Tigers forced a total of three turnovers while their defense came up big at crucial times of the contest to shut out Oak Harbor. Oak Harbor finished with 260 yards while Liberty Center had 295 in the game. Schulte finished with 81 rushing yards while Jac Alexander had 15 carries for 59 yards. Alexander completed 11-of-23 passing for 119 yards while Hunter Wilkins had five catches for 77 yards. Schulte added four catches and Tyler May hauled in three.